Holiday Comfort Food At It's Best — Triangle Pastry Co. Here we are in the midst of Chanukah. Usually I start off with potato latkes, but I had an unruly hankering for some kugel. I was talking with a friend who had never tasted pineapple noodle kugel and I pretty much fell out of my chair. Blasphemy! My recipe came from my mom. She got it from her mom. Who presumably got it from her mom, and so on. I've changed it a bit to suit my preferences, but it's still the same basic, easy, and delicious recipe. Please make it and enjoy it with a huge idiotic smile on your face just like I do. I mean, it's basically cheesecake that you eat for dinner. Add your own personal touch with different spices or additions like thyme, nutmeg, peaches, or dried cherries. Maybe some orange zest... And pass it on. Because sharing food is joyful. First, boil the noodles. Also, set your oven temp to 350F. Get out a 9x13 or similarly sized casserole dish. You don't have to grease or line it. Just have it ready. While the noodles are cooking, cream together the butter and sugar. Mix the salt, flour, and cinnamon into one egg, then mix in the other 2 eggs. Then beat the egg mixture into the butter/sugar bowl. Mix the cream cheese and sour cream together until the mixture is smooth. Stir that into the egg mixture, until homogenous. NOTE: This all seems fussy, I'm sure, but it's just the way I do things as a baker. Pretty certain my mom throws everything in the bowl of a food processor and whips it up together. It still yields great results. Add the pineapple and noodles (Well drained. We don't want extra fluid.) into the bowl and stir it up. Evenly distribute the batter into the dish. Pop it in the oven and bake for 45-55 minutes, depending on the exact size of your dish. 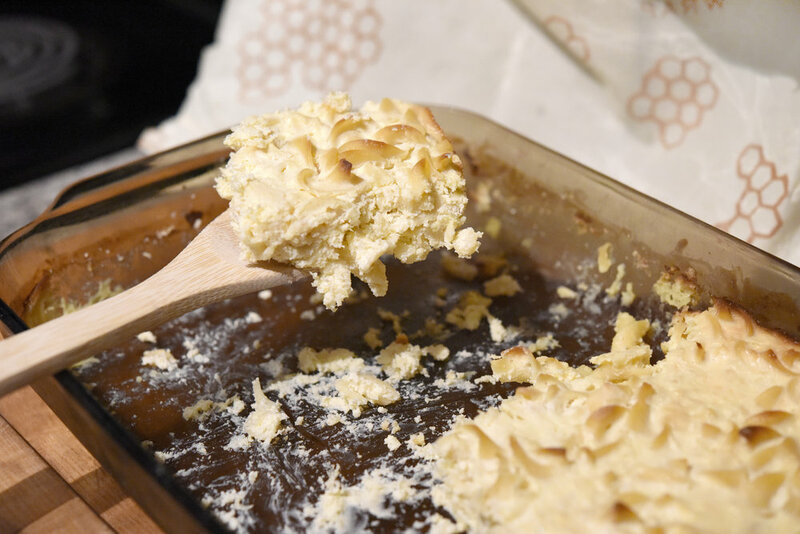 A smaller dish will yield a thicker kugel and take slightly longer to cook thoroughly. Worth the wait, I promise.